How Much Does the 2017 Dodge Journey Cost? How Many MPG Does the 2017 Dodge Journey Get? What’s New for the 2017 Dodge Journey? The base engine is 2.4-liter four-cylinder engine. It is powered by 173 horsepower and 166 pound-feet of torque with front-wheel drive and four-speed automatic transmission. It has a fuel economy of 21 mpg combined with 19 mpg in the city and 25 mpg on the highway. Another engine option that is standard on the GT is a 3.6-liter V6. It is powered by 283 horsepower and 260 pound-feet with a six-speed automatic. It comes with all-wheel drive, but the GT can have AWD or FWD. The fuel economy on the FWD is 19 mpg combined with 17 mpg in the city and 25 on the highway and the AWD has 19 mpg combined with 16 mpg in the city and 24 mpg on the highway. When the Journey has the V6 engine it can tow up to 2,500 pounds. The 2017 Dodge Journey is available in five- and seven-passenger configurations. It is available in five trim levels: base SE, SXT, Crossroad, Crossroad Plus and GT. The SE comes with roof rails, heated mirrors, a sliding and reclining second-row seat, a 4.3-inch touchscreen, and a six-speaker sound system. You can add the Flexible Seating package, which adds a 50/50-split third row and tri-zone manual climate control. Going up to the SXT it adds foglights, a unique front fascia, LED taillights, body-colored exterior mirrors, and the Flexible Seating package. The Crossroad includes gloss black and chrome exterior trim, a leather-wrapped steering wheel and shift knob, and Bluetooth. The Crossroad Plus expands the Crossroad’s features with tri-zone automatic climate control, LED interior lighting, leather upholstery with mesh inserts, a six-way power driver seat, a fold-flat front passenger seat with a hidden storage bin, an 8.4-inch touchscreen, and an in-dash DVD player. The GT comes with remote engine start, a body-color grille, a sport-tuned suspension, automatic headlights, heated front seats, a heated steering wheel, an interior observation mirror, and a premium audio system with a subwoofer. The Dodge Journey is packed with safety. You and your passengers will feel plenty safe with all the standard safety features. It comes with anti-lock brakes, active front head restraints, side curtain airbags, front side airbags, driver knee airbags, and traction and stability control. You can add features like rear parking sensors and a rearview camera. The rear parking sensors help the driver detect objects behind the vehicle and will warn them if the vehicle gets too close. The rearview camera shows what is behind the vehicle on the touchscreen. 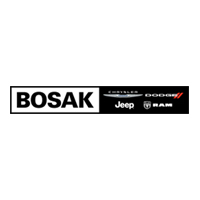 Stop by for any questions and check out the 2017 Dodge Journey at Bosak Motor Sales, located in Merrillville, Indiana, near Crown Point and Valparaiso. The 2017 Dodge Journey is ready for your test drive today, so give us a call.